PHOENIX (January 28, 2019) — (GLOBENEWSIRE) GlobalTranz Enterprises, Inc., a leading technology and third-party logistics solutions company providing award-winning Transportation Management System (TMS) products to shippers, logistics service providers and carriers, today reported fourth quarter 2018 and full year 2018 earnings. 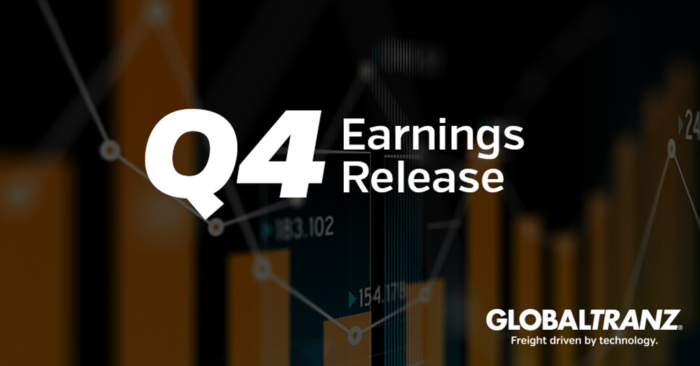 In the fourth quarter of 2018, GlobalTranz reported a revenue increase of 53 percent, net revenue increase of 58 percent and EBITDA growth of 127 percent year-over-year. For the full year, GlobalTranz reported $1.4 billion in revenue, representing 62 percent growth year-over-year, a net revenue increase of 63 percent, and EBITDA growth of 150 percent. New customers, trail-blazing acquisitions, continued organic expansion of existing customer relationships, growth in users of the company’s advanced end-to-end enterprise logistics platform, and strong performance of transactional and managed transportation solutions drove the company’s fourth quarter and full year results. Completed 2 strategic acquisitions (completing a total of 7 acquisitions in the period of January 2017 through December 2018) that further expanded the company’s footprint and capabilities while adding world-class talent. These include Chicago-based AFN Logistics and Greensboro-based SynchOne, LLC. Released new technology products, and prepared for the 2019 roll-out of the all-new, market leading GTZcommand™ Transportation Management System (TMS). Named among the Top 10 Freight Brokerages in the U.S. by Transport Topics. Voted an Inbound Logistics Top 10 3PL provider for exceptional service and quality in meeting the needs of shippers and carriers. Closed a new equity partnership with The Jordan Company, L.P. (TJC). Made key executive promotions in early 2019 with Bob Farrell assuming the role of executive chairman, Renee Krug appointed CEO, and Lara Stell named CFO along with the election of industry veteran Eric Kirchner to the company’s Board of Directors. “We could not be prouder of the accomplishments of the GlobalTranz team, and we expect 2019 to be a year of continued success as we continue to deliver enhanced technology, services, and solutions to help our shipper customers realize operational and competitive advantages that allow them to achieve their goals in 2019,” said Bob Farrell, executive chairman of GlobalTranz. For more information, visit www.globaltranz.com and follow us on LinkedIn and Twitter @globaltranz.